Of course, there are no strict rules about composition, but as a guideline, you may want to consider three elements that are common in great landscape photos: a foreground, background, and great light. Auto white balance usually works pretty well, but sometimes it’ll cause problems for landscape images. This usually happens when the majority of your photo is one color. If you shoot in RAW though, you can safely fine tune the white balance setting later in post-processing, without sacrificing any quality. With long exposures (anything more than a second), you’ll start to have more noise problems, so most cameras have a special noise reduction feature for these long exposures. Remember to turn it on if you’re photographing a scene in extremely low light. Sometimes you can’t always bring a tripod with you, so in those cases you can just improvise with the objects around you: rest your camera against a large rock or lean against a tree. Anything to help you reduce camera shake will lead to sharper photos. The height of your camera in relation to the landscape will help communicate a particular emotion, so consider what you’re trying to convey with the photograph. The higher the camera, the more superior the viewer will feel over the landscape. On the other hand, if you place the camera closer to the ground, then the viewer will feel more inferior to the landscape, as if it’s conquering them. Before you go out to photograph a landscape for the first time, it’s a good idea to scout the area first by looking at a topographic map and using a program like Photographer’s Ephemeris to determine where the sun will be when it rises and sets. This way, you’ll know where that glorious light will shine during the golden hours. With the lighting conditions constantly changing during the golden hours, it’s important to get to your photo location well ahead of time to setup your shot and wait for that perfect moment. With some photos, you may want to include a foreground that’s very close to your camera, along with a background that’s very far. Even with a super small aperture, this will likely cause depth of field problems, so you can try taking two photos in this case: one that’s focused on the foreground and another that’s focused on the background. Then, just merge these two photos later in post-processing. This is a post I recently wrote at the Digital Photography School, about how to setup your tripod. Although the tripod seems like a pretty simple piece of equipment, there are a few things to keep in mind when you set it up to ensure you get the sharpest image possible. Okay, so I don’t have a blog post on this one yet, but I like prime numbers, so I wanted to make sure I had 11 tips. Anyway, one of my favorite things to do when I need inspiration is just explore photos on Flickr. 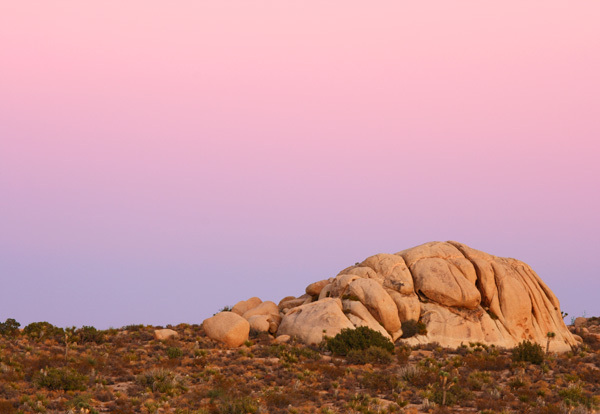 Sometimes I just look through the photostreams of some of my favorite photographers (like Kevin McNeal, Ben Hattenbach, Patrick Smith, or Michael Menefee), and other times I just look at photos from my favorite locations (like the Mojave Desert or the chaparral of Southern California). There are a couple of new (to me) tips here, thanks! I particularly like your explanation in #6. I often shoot several heights and angles, but never understood the underlying reason why some look better than other. I recently subscribed to your feed and I’m enjoying your posts because I tend to photograph places and things rather than people. Thanks! Regarding #4 do you really find that helpful? Seems with the noise reduction capabilities of LightRoom and Photoshop that this step wouldn’t be necessary. I also think in some cases it may double the exposure time so a 4 second exposure becomes an 8 second one. The first 4 seconds are for capturing the image and then the next 4 are for noise reduction. For me I disable all in-camera noise reduction and just deal with it in post. Hi Steve, I have found that balancing the camera on a bean-bag really can help when a tripod is not available. The advantage is you can tilt the camera on it for targeting your subject matter. @Wayne – Welcome to the group! Glad you’re enjoying the posts so far! @Zack – Honestly, I haven’t done tests with and without the extra noise reduction, but based on how it works and what I know about focal plane arrays, it does make a lot of sense to me. I should definitely do some actual tests though to be sure 🙂 You’re right that it basically doubles the time you have to wait (cause it takes two exposures of same length), so that’s annoying, but one shortcut is to get a perfect exposure at a high ISO and wide aperture first, and then just do the math to translate that shutter speed to your desired ISO/aperture. @Frank – great suggestion about the bean bag! I have the advantage of being a COMPLETE beginner DSLR – nothing to unlearn! The tips for me are not tips; they are lessons. But here and there things are slightly too fast for me. I have just rediscovered the United States of America on the world map (from Mauritus here):- about being there early and start looking around etc. – beginner brothers: be there a hell of a lot earlier. A lot of good info here Steve ! You finally got me to order “The Camera” from Amazon !!! Steve thank you for a nice advices. I’m a the beginning level, and still learn about proper exposure, but your advices make sense and giving a good direction.